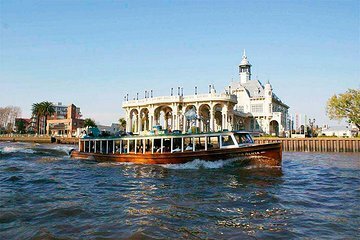 Enjoy a 5-hour tour that features a boat cruise through the Parana Delta from Tigre, located near Buenos Aires. Glide along picturesque waterways to glimpse daily life for the Isleños — locals who live in houses perched on stilts and conduct business by boat. Your guide shares details about the history and culture of the region as you see one of the world’s most unusual river deltas. On your return drive, pass elegant homes in the northern suburbs and San Isidro, and the Presidential Residence (Quinta de Olivos). Please note that there are some hotels in the city that are not included in our pickup routes. If your hotel is not included, we will contact you to inform you of the closest pick up location. Please wait for the guide in the lobby of your hotel. Basically a boat tour to look at peoples' cottages. Although the cruise was very interesting and our bus guide was very good and informative, this excursion did not meet our expectations. We spent most of the time on the bus and made one 25 minute stop on the way back which did not add anything to the tour. This was a very nice tour that took you outside of the city of Buenos Aires. Ashlynne was a good guide. I would highly recommend it. The boat trip was really enjoyable and the area is quite unique. A fascinating contrast to Buenos Aires and well worth visiting. Unfortunately our guide showed little enthusiasm or interest and much of what we learned during the boat tour came from our overheating other conversations. If you want to expierence simplicity and get back just to being grateful this trip is a must do. To see how people survive just with each other and the basics of nature and how they need to get by is amazing, I'm not sure if I will be able to live like this. The tour guide Elba was great and very helpful a bonus that all languages were catered for. Great tour and tour guide a must do, and I highly recommend it. Pick up worked well and the whole trip was good.